It is important for your rest and rejuvenation that you create a sacred space for yourself where you feel peaceful and tranquil and can connect with nature, or create this in your mind for yourself regardless of where you are. It helps you to rest, relax and regain your bearings and sometimes your very sanity. No one can take this from you as it is yours. Create a pyramid of light within your sacred mind and heart and it is yours to do with as you please. Sometimes there is so much going on around you it is hard to find space for yourself and this is precisely when you should take the time to go to this special place so that you can reconnect once again with that greater part of yourself that is wise, still and peaceful. It will provide you with a much needed respite from all that is happening in your time. This is a time of accelerated energy on the earth and it can bring with it much confusion and manic behaviour that leads many to be unproductive and unfocused. When you feel that happening for you that is your signal to take a moment, take a breath and re-orient yourself with your now and your goals so that you can continue on with bringing your dreams and desires into physicality. Be gentle with yourselves and others as you move ahead for it is not always easy and you are roughest on yourselves and your expectations are sometimes not on what is truly important for you and your growth. It is often based on the expectations of others or the mental energy of your 3D world. Take a good look at your life and see where you have been and where you are heading and decide if it is truly where you choose to go now. Sometimes these are outdated ideas that you created in your past and these need to be renegotiated for the new you that is in your now. 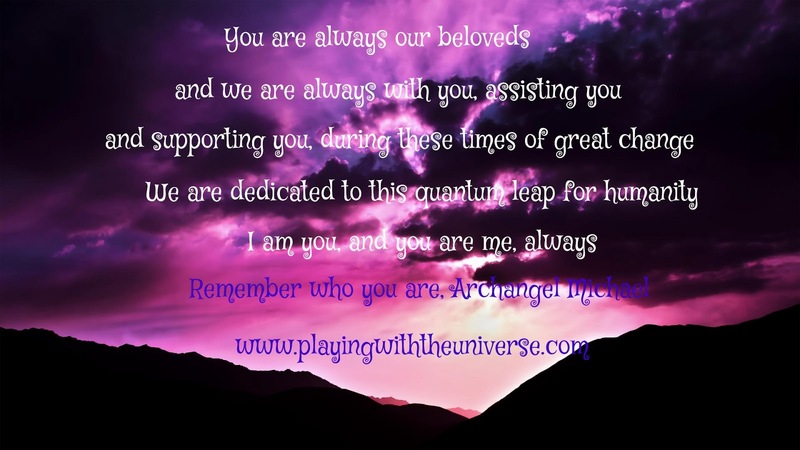 Spend time communing with your guides and angels and higher self for they can help you see yourself and your path from the perspective of your complete self and help you integrate all the aspects of you into the one. The better your connection and relationship you have with your higher self, the more you begin to live the life you have been longing for within your hearts. While you are having a physical experience, and it is important to remember that you are indeed needing to create certain things for yourself in the physical world, it is easy to be overly focused upon the material and the mental aspects of your journey. We wish to remind you that it is also important to focus upon the whole of who you are and also honour and remember the emotional and spiritual parts and integrate the four into all parts of your lives. This will help you experience the completeness of your journey and to help you have the life experiences you deserve and desire. If you are currently challenged by much of what is happening around you, take the time to just be in the moment and remember that this too shall pass and that there are always better times ahead. Keep your focus on creating the energy you desire and do not descend into the darkness of the ego and the mental aspects of the mind. These are the opportunities for you to go beyond your current state of evolution and you will. You are exactly where you want to be, even if you do not understand the why. Finding the gift within each experiences helps to lead you to even more and that is precisely why you chose to be here at this time of humanities evolution and know that it will lead you to the growth that you seek for your soul and that it is part of the magnificent purpose of the lightworkers who are incarnate at this time. Go with the knowledge that the god force is inside of you and that you are an important part of this great shift. You are not alone upon your path and know and trust that we are always beside you, supporting you should you think that you have stumbled and are always with you to help you up in your times of need. The better and stronger you make this connection, the more confident you have in your choices and your journey. It is a beautiful time to be incarnate angels and it is a wonderful time to be alive with spirit and experiencing life in all its glory. Cherish your path and your journey, cherish yourselves and nurture and cherish the beauty in others so that they too feel the calling to step up their own journey to be at one with the path of light.